These items are not part of the Pattern 1919 Naval Web Equipment, but are part of the Mills Pattern 1919 Rifle Equipment. 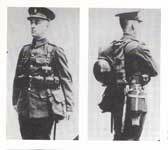 The photos at left are Mills Company pictures illustrating the Pattern 1919 Rifle Equipment. 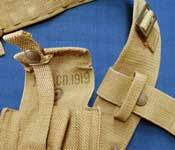 This Web Equipment, Pattern 1919 Back adjustment strap for the Rifle Equipment is very interesting. 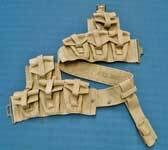 If you compare it to the Back adjustment strap portion of the Web Equipment, Naval, Pattern 1919 Waist belt shown on the W.E., Naval, Patt. 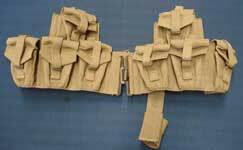 '19 Belts, Braces, & Straps page, it is almost identical, except for the addition of the two fastener spigots used to attach to the Frog. According to all of the literature we've seen, the presence of these spigots is an indicator of a W.E. Patt. '25 Back adjustment strap, and they were not present on Patt. '19 Straps. This undoubtedly pukkah example, though, suggests that, while the Naval W.E. Patt. 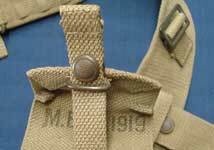 '19 Straps did not have the spigots, they were present on the Rifle Equipment Straps. It must be noted that, because of the very early date on this example, there may be later but similar Rifle Equipment Straps that were made without the spigots. This example is maker marked "M.E. Co." and dated 1919. From the Brian J. Burns Collection. Photos this section © Brian J. Burns 2009. 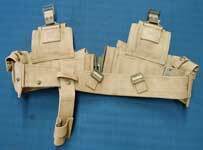 The Web Equipment, Pattern 1919 Cartridge carriers are mirror images of each other, and connect to the Strap, back adjustment. 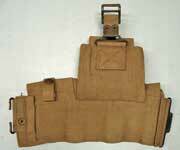 Each Carrier has four pockets, and each pocket holds 15 rounds of .303-inch ammunition in three 5 round chargers. These Carriers are similar to the later W.E. Patt. '25 Cartridge carriers, but have a distinctive outside retaining strap that makes them obviously different from the later pattern. Also notice the fastener spigot at the rear of the left Carrier. This was there to locate the Frog so that it would not "float" free on the Back adjustment strap. This feature would also be used on the later W.E. Patt. '25 Cartridge carriers. This type of Carrier was never adopted by the British Army, but was used by some Colonial military organisations such as the West African Frontier Forces. These Carriers are maker marked "M.E. Co." and dated 1919. From the Brian J. Burns Collection. All photos this section © Brian J. Burns 2009. Rear views of the same pair of Carriers. More pics of this pair of Carriers. Details of the Carrier pockets, showing the retaining strap. 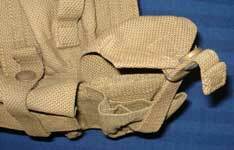 Compare this with the design of the retaining strap used on Patt. '25 Carriers, where it has been moved inside, under the flap. More details of the Carrier pockets, showing the internal dividers that separate the three chargers carried in each pocket. This truly illustrates the almost unbelievable refinement of the weaver's art exhibited in these Carriers - the entire body of the pocket, including the internal dividers, is woven as a single piece, rather than being sewn into place. 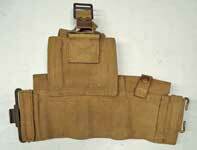 This Entrenching tool carrier is part of the Pattern 1919 Rifle Equipment. It is designed to carry both parts of the Patt. '08 Entrenching tool (the Sirhind tool), along with the Mk. V or Mk. VI Water bottle in Carrier. Although not identical in detail, the design is similar to the Entrenching tool carrier for the Canadian Patt. '13 Web Equipment, and very different from the Patt. '08 method, which uses separate Carriers for the Entrenching tool head and Helve. In this design, the Entrenching tool head is carried vertically, with the pick end down, resting on a metal support. The Helve is inserted in the two loops on the right side of the Carrier, while the Water bottle carrier is buckled to the front, using the short strap sewn to the Entrenching tool carrier. This example is maker marked "M.E. Co." and dated 1927. 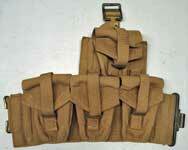 This Water bottle carrier is part of the Pattern 1919 Rifle Equipment. 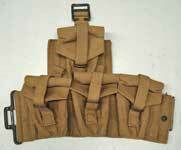 It is similar to the early version of the Pattern 1937 Water Bottle Carrier, with the addition of a short chape and 1-inch buckle on the bottom. This buckle is used to attach the Carrier to the front of the Entrenching tool carrier. The picture at the near left shows the complete assembly with the Bottle, Entrenching tool, and Helve in place. This example is maker marked "M.E. Co." and dated 1927. This Bayonet frog is part of the Pattern 1919 Rifle Equipment. It is identical to the type of Frog used in the New Zealand Pattern 1913 Web Equipment, but with the addition of a fastener crown just below the upper retaining loop. This fastener attaches to a matching spigot on the left Cartridge carrier. This design was also used with the Web Equipment, Pattern 1925. The same Frog design, without the fastener, would continue in service and be used with Web Equipment, Pattern 1937. It is designed to carry either the Pattern 1888 or Pattern 1907 Bayonet in scabbard. This example is maker marked "M.E. Co." and dated 1919. From the Brian J. Burns Collection. Photos © Brian J. Burns 2009.